Graphic Novel (Guest) Review 76/365: Paper Girls – Brian K. Vaughn Week! Today’s review is penned by fellow Comic Book Teacher Adan Alvarado…enjoy! Brian K. Vaughan and Cliff Chiang open Paper Girls with a dream sequence that had me eating out of the creator’s hands from the 5th page when Erin (the dreamer) wakes up and immediately checks on her little sister Missy (who didn’t fare too well in the dream). Missy rolls over and shoots Erin an understandably annoyed look from the bottom bunk. In the moment Vaughan and Chiang captured a very real and often nauseating feeling for those of us who unwittingly place stock in dreams or the twisting of doorknobs three times before leaving a loved one locked safely in our home. The ego-maniacal feeling that somehow your unconscious thoughts or trivial and unrelated acts will somehow have an impact on the world around you. The first five pages, or really the five panels that make up the post dream scene sets up Paper Girl’s thematic core: the unrelenting feeling of helplessness that teenagers may feel when the their concerns go unheard, or worse, are cavalierly dismissed by the powers that be. I would be remiss if I did not discuss the nostalgic element that has and will be attributed to the series (and any work that takes place in the 80’s until Gen Xers age out of the tastemaker process). 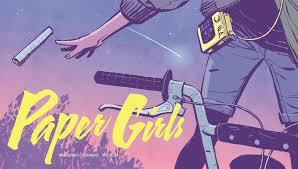 Paper Girls undoubtedly has qualities that can be found in some popular 80’s films: the organic language of frustrated teens is reminiscent of John Hughes’ works, you can see shades of The Monster Squad in the “in over their head” Paper Girls, and Mac will draw comparisons to Chris Chambers in terms of “wrong side of the track” gravitas. However, despite the possible allusions or homages Vaughan only uses “nostalgia” as setting or Easter eggs (knocked over Fun Fountain was a nice one), and never allows it to become a crutch. Okay, so what is Paper Girls actually about? Well it’s actually about a group of girls working their paper route the morning after Halloween. One of the girls gets jumped and the assailants make off with her walkie-talkie, I am sorry, her Realistic TRC-218 CB. In pursuit of the radio, the gang finds themselves at an abandoned home where in the basement they find a strange, almost living space capsule. Following the discovery of the capsule, all hell breaks loose: deformed time traveling teenagers, dream sherpa Ronald Reagan, and futuristic knights that answer to a hip hop t-shirt wearing cult leader and ride around on pterodactyl like creatures. It sounds pretty ridiculous, and it is, but it works. It works, because it all exist as an answer to a question. A question that one of the paper girls begins to consider with an assist from an attacking telepathic alien (that’s right). A question that is beautifully illustrated by Cliff Chiang in thirty-six panels on four panoramic pages: when those designated to nurture and protect us have failed in that task, what must we do? I’s like to thank Adan for the great review, and I’d like to add that in a sea of 80’s pop nostalgia, Paper Girls does it as good or better than most of it…I’m looking at you Strange Things.